The following video and drone footage has content that you should not try to emulate. 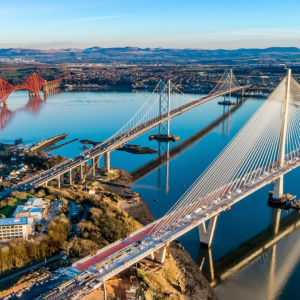 Drone flying in the proximity of the bridges is prohibited without the necessary permissions and Licences ! The Three Bridges from the air. 12.44 mins. Rail Bridge with North & South Queensferry. 13.45 mins. Journey by Steam train over and back the Rail Bridge. 8.52 mins. Bridges, shoreline and yaughts from South Queensferry. 2.55 secs. UNESCO World Heritage site, video and stats. 3.15 mins. The bridges at sunset on the Forth. 9.37 mins. 3D scanning the bridges. 1.55 mins. Through the fog, more like the GG in SF. 3.43 mins. BBC report August 2013. 4.49 mins. December 2015 Queensferry crossing build. 5.27 mins. Deck section being lifted into place. 4.52 mins. 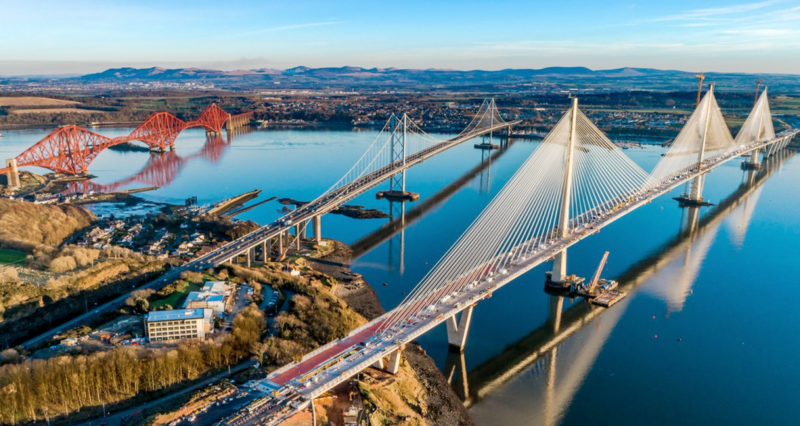 Aeriel footage of the Queensferry crossing during construction. 3.22 mins. Cabling proceedure, needs a head for heights. 4.08 mins. BBC report august 2014.